The story begins in the 13th century. 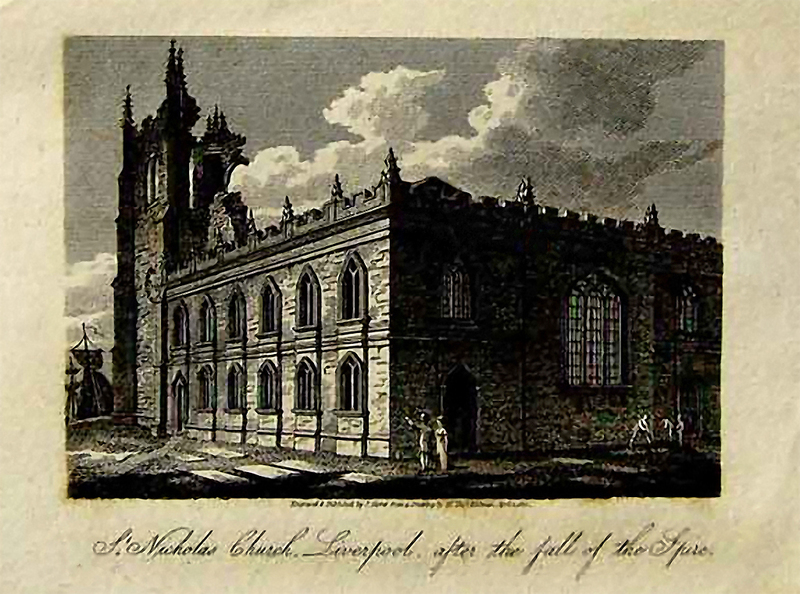 Liverpool received its charter from King John in 1207. 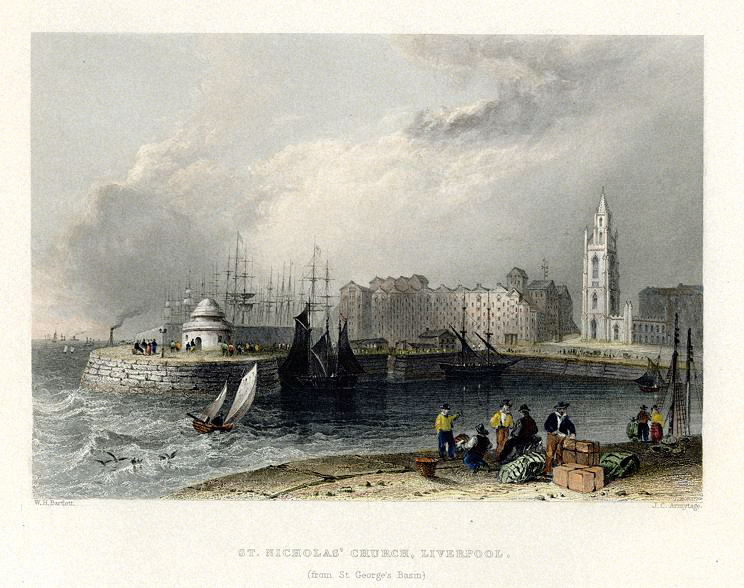 A small stone chapel known as the Chapel of St Mary del Quay probably stood close to the site of the present tower overlooking a quay on the River Mersey. In the years 1355-61 a new chapel, dedicated to St Mary and St Nicholas, was built on land granted to the burgesses by the Duke of Lancaster. 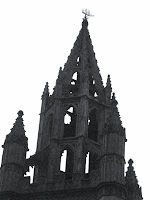 During a plague in the town in 1361, the Bishop of Lichfield and Coventry (whose diocese then included North-west England) licensed the burial ground, and the following year the chapel itself was consecrated. By the late 15th century a north aisle, the same size as the nave, had been added and three chantry altars had been established each with its own priest paid for by a wealthy patron for whose soul he was to pray: in 1515 a fourth chantry was founded. During the English Reformation, the chantries were abolished. The building was adapted in stages to suit the form of worship found in the Book of Common Prayer. Between 1673 and 1718, the building was extended piecemeal, and galleries were built to seat the increasing population of Liverpool. 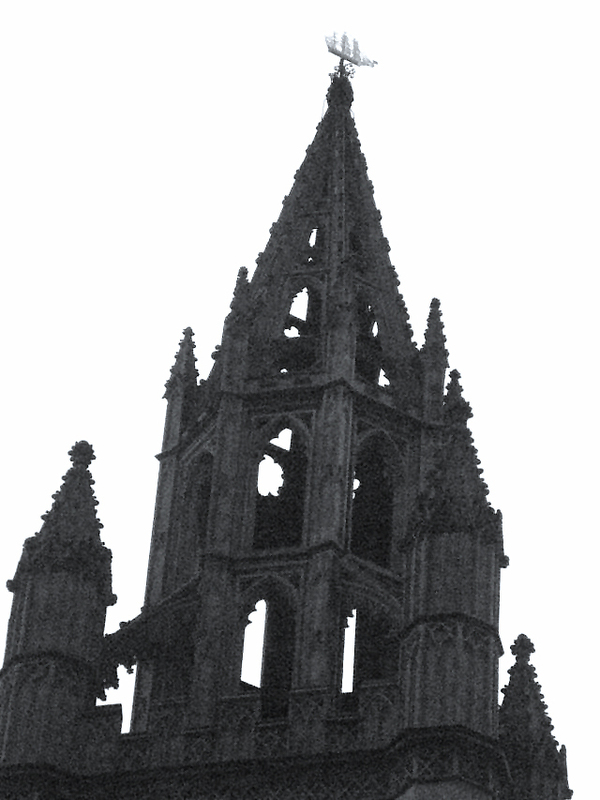 A spire was added in 1746. 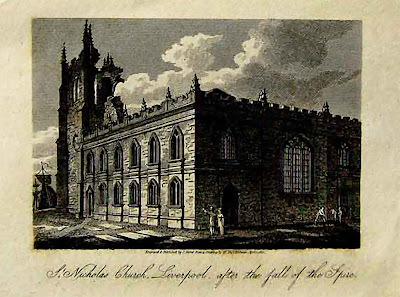 In 1699 Liverpool, now with a population of about 5,000 people, was created an independent parish with (unusually) two parish churches and two rectors. Our Lady and St Nicholas (the "Old Church" or St Nicks) and the new parish church of St Peter's were established as the parish churches. In 1775, the parish decided to rebuild the walls of the existing church. The galleries were kept, as the congregation paid pew rents. A new roof was set atop classical columns, which rested on medieval bases. The reconstructed church had walls four feet longer than the original structure. By the year 1865, there were 27 churches in the parish, housing around 275,000 people. 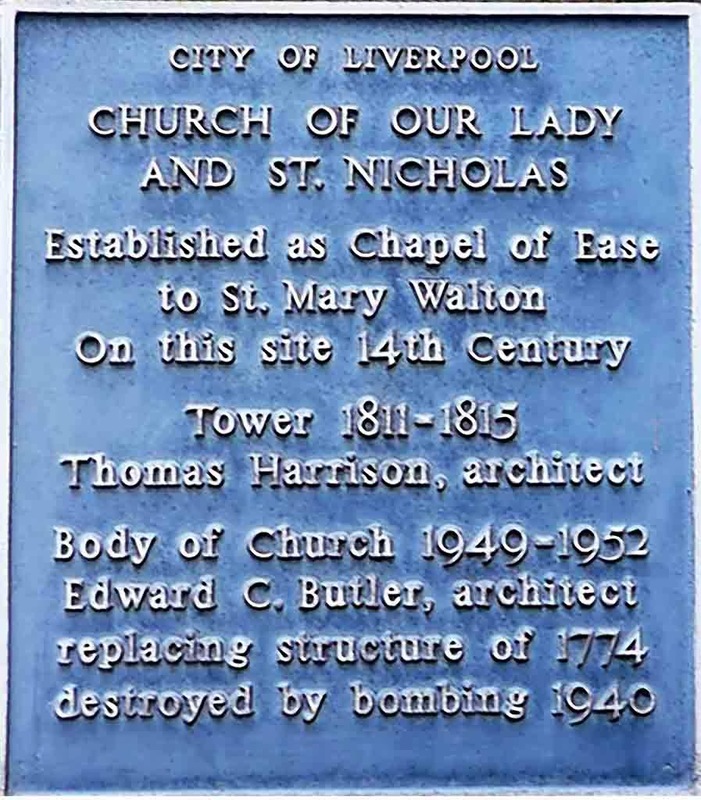 Since 1916 Our Lady and St Nicholas has been the Parish Church of Liverpool. St Peter's, which was situated in Church Street, was demolished in 1922, having served as pro-cathedral for the Anglican Diocese of Liverpool. Between 1811 and 1815, a new tower and lantern were built at the north side of the church. The tower was designed by Thomas Harrison of Chester. The last remains of the original chapel of St Mary del Quay, which had been used as a tavern, were demolished. Within the tower, a new ring of 12 bells was installed, cast by Dobson of Downham Market. The Tenor bell was recast by Warners in 1912. Over the years, several small changes were made to the church for liturgical reasons. The most notable changes occurred between 1851 and 1852. 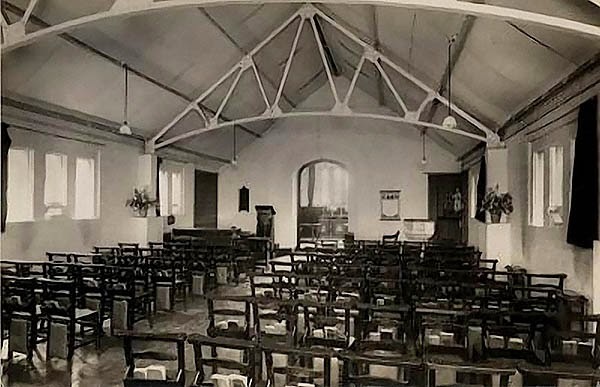 The Parish Centre was built in the 1920s to accommodate community life and a church school. Apart from these changes, the church remained the same between 1815 and 1940. During World War II, the bells were removed for safety, but they were never re-hung. 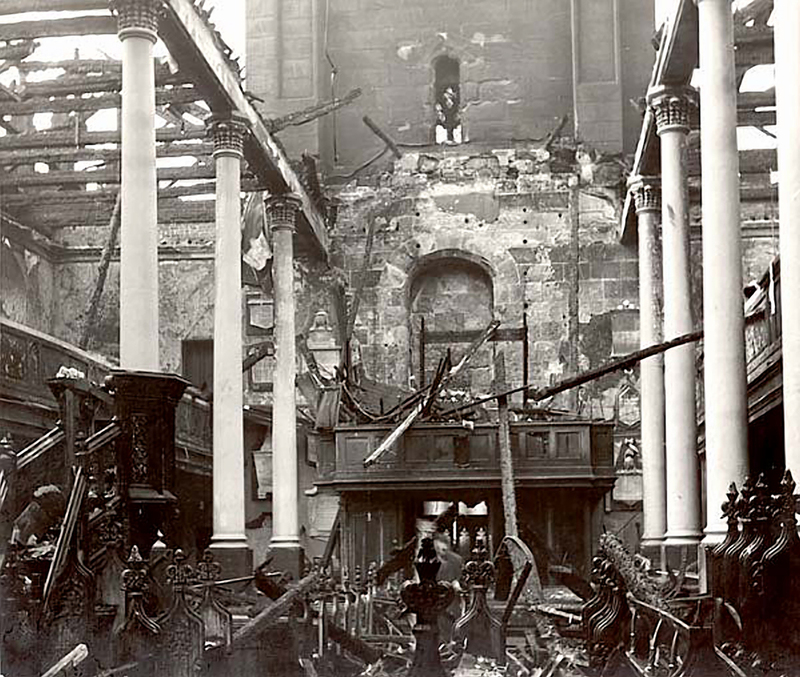 Following a German air raid on 21 December 1940, the main body of the church was destroyed by fire, leaving only the parish rooms, vestries and the 19th century tower. 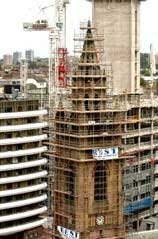 Rebuilding did not begin until March 1949, and the church was consecrated in 18 October 1952 (the Feast of St Luke). A new ring of 12 bells was cast by John Taylor and Co. of Loughborough. The new church was designed by architect Edward C. Butler, who introduced major changes to its design. Rather than the traditional practice of placing the altar at the east end (for the light of the rising sun and to signify the Resurrection), Butler placed it at the western end of the church. In order for the congregation to continue to worship, a temporary church within St. Nicholas, this was erected inside the old shell using the old tower as the chancel. Photograph circa 1950s Liverpool Records Office. Unlike churches in which the pulpit is traditionally the most prominent feature, Butler emphasised the sanctuary. He excluded the galleries, which had helped seat the historically large congregations. This decision reflected the smaller contemporary congregations. The nave was designed as 46 ft (14m) taller in the new church. The positions of the organ pipes and Refectory were changed; situated above the Narthex (entrance vestibule), they reduced the seating space within the church. The exterior of the church is notable for its distinctive lantern spire, which can be easily spotted from the river, despite being overshadowed by many taller buildings of the city's business district. The nave and the sanctuary house fixed woodwork carved with the vine as the dominant motif, referencing Christ: "I am the vine, you are the branches". In the southeast corner of the church is a stained glass window: Our Lady stands in glory as in Revelation and St Nicholas holds a ship. An inscription reads: "For the Healing of the Nations". A war memorial for the Cunard Steamship Company, placed in the church in 1989, is in the north east corner. The church organ is by Rushworth and Dreaper of Liverpool, and is dedicated to the memory of Charles W. Bridson, organist 1902-1949. 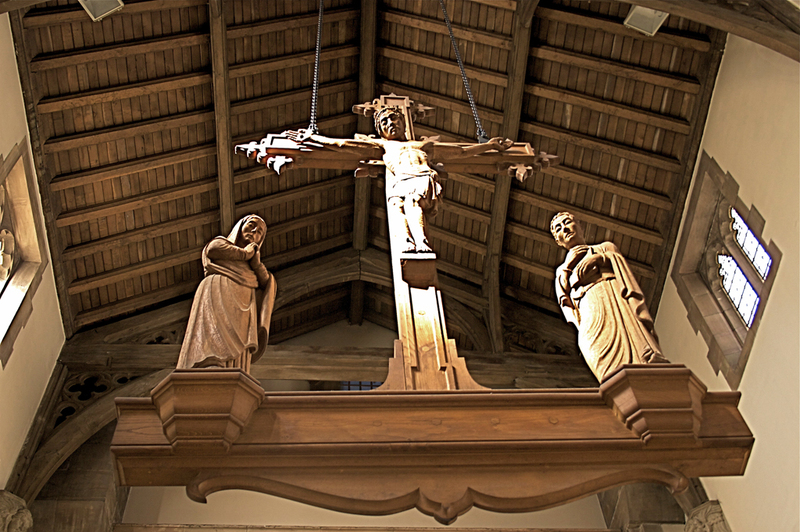 Hanging between the nave and the sanctuary is the Rood, a figure of Christ with Our Lady and St John. The Rood is carved from the old oak bell frame from the tower. Charred timbers from the old church form the cross in the Chapel of St Peter, As a boy I was the sacristan in the church and at the time the charred cross was on the wall on the left of the Narthex as one entered the church. An elderly man looking around the church told me that he was one of the firemen that fought the blaze and that it was he who nailed the two charred timbers together after the fire was under control. He told me that he had carved his initials into the timbers and told me his name, so I unhooked the chain that held the cross to the wall and sure enough there were initials on the back of the cross. I was only about 15 at the time and can not now recall the gentleman’s name although I did pass the information on to the then Rector of Liverpool, Cannon Young. Two chapels are on each side of the altar, St Peter's on the left and St Mary's on the right. The Chapel of St Peter commemorates the old co-parish church of St Peter's, which stood on Church Street. The 18th-century wooden table was once the altar there. The Sacrament is reserved here, and the chapel is used for weekday Communion services. Charred timbers from the old church were used to form the cross on the wall. 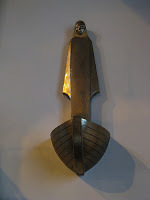 The Maritime Chapel of St Mary del Quay was dedicated in 1993 as part of the celebrations for the 50th anniversary of the Battle of the Atlantic. It memorialises the medieval shrine. A statue of Our Lady, cast in bronze, is shown standing in the prow of a boat. The statue was created by Liverpool artist Arthur Dooley. 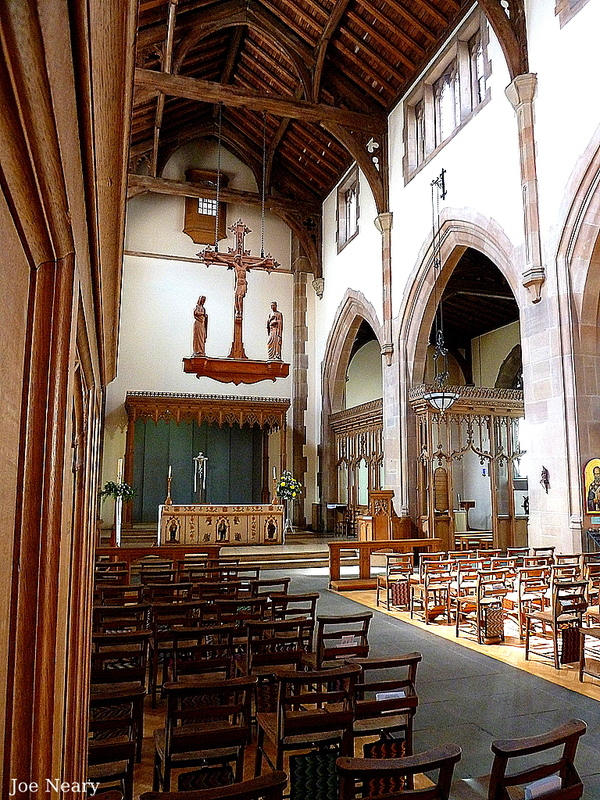 The furnishings in the chapel are by Robin McGhie. The chapel contains a Book of Remembrance, listing the names of mariners lost at sea. The churchyard used to be surrounded by walls. From 1758 to 1772, a battery of guns stood on an area of the burial ground (now covered by road) to defend the river. Until 1767, when Georges Dock was built where the Liver Building now stands, the River Mersey reached the church garden walls at high tide. In 1849 the churchyard was closed to burials. In 1891 it was transformed into a public garden in memory of James Harrison, whose shipping company had its offices facing the churchyard until the early 21st century. In 2014 a secret upper floor room in a Liverpool church has revealed, The first floor room can only be reached by two sets of step ladders via the top of a wardrobe and a trap door. It is believed the room was used as a play area for small children, but was made inaccessible after a gallery which led to its entrance door was destroyed in the Blitz on December 20, 1940. A number of toys were found in the room including a small model of a Spitfire fighter plane, introduced in mid-1938, which dates the items to the two and a half years between then and late 1940. Also found were parish hymn and prayer books, including an 1696 Annotations of the Holy Bible.